Even better than a snow day . 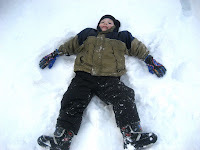 . . the day after when you have PERFECT packing snow! 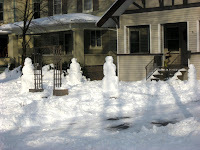 The kids had a great time making 4 snowmen in our yard. And 1 snow dog. 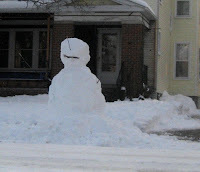 Then they went across the street where John and our neighbor make a HUGE snowman. 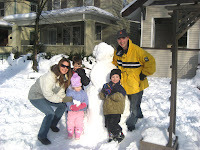 We ended the fun with some SNOW ICE CREAM, YUMMY! And then came in for WARM drinks! 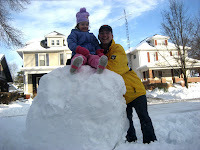 Mikayla on top of the HUGE snow ball that became the Middle of our giant snowman. 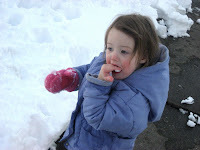 Mikayla spent most of her time eating snow! 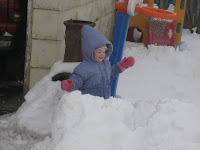 Mikayla in our neighbors back yard navigating her way through the snow! 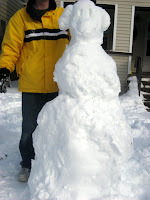 during my entire childhood, every adult that ever watched me on a snow day at one point said the words, "We ought to make snow cream sometime." 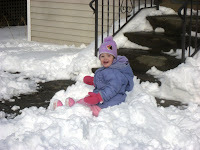 And to this day, I still have not made snow cream, ever!!!! !